Containerized Membrane BioReactor Wastewater Treatment System (MBR-C) - Pure Aqua, Inc.
MBR-C is a containerized MBR which utilizes hollow fiber (HF) ultrafiltration (UF) membranes with nominal pore size of 0.04 µm. In a typical MBR-C system, feed water passes through a drum screen to mitigate suspended solids and protect membranes’ surface. Water is then transferred to a bioreactor where microorganisms decompose organic content to mineral constituents of CO2, H2O, and inorganic nitrogen products at ambient temperature. Thereafter, water overflows to membrane tank(s), where UF membranes achieve complete retention of bacterial flocs, suspended solids, small colloids, and viruses. MBR-C utilizes submerged membrane module (SMM) products featuring the best-in-class thermally induced phase separation (TIPS) polyvinylidene difluoride (PVDF), innovative modules, and skid designs to provide the most compact, simple, and reliable solution. SMM products are typically implemented in MBR applications treating municipal and industrial wastewaters. They are designed to effectively meet the needs of customers designing a new facility or replacing existing skids of any other manufacturer. 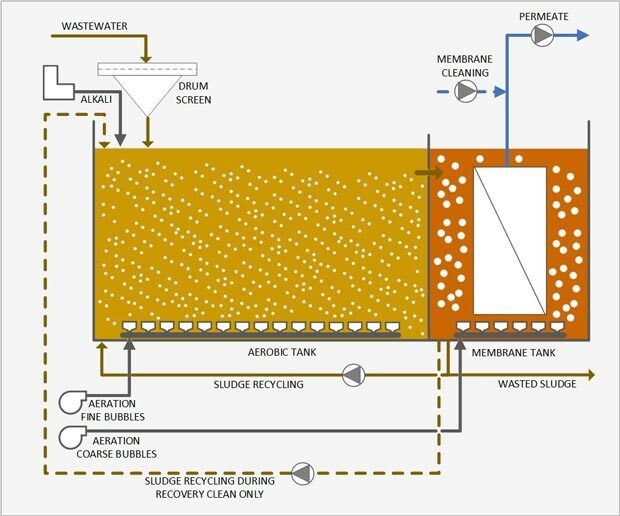 Integration of bio-treatment and membrane filtration eliminates the need for sedimentation tank and allows for compact design and installation. Minimal pumping requirements reduces equipment and operational costs. Lower sludge production rate, due to higher sludge age (i.e., SRT), compared to conventional activated sludge processes results in savings on disposal expenses. High mixed liquor suspended solids (MLSS) concentration and volumetric loading rate translate into compact footprint. Membranes are capable of retaining activated sludge at high MLSS concentrations, leading to more effective BOD and nitrogen removal. UF membranes are capable of removing small colloids and viruses in addition to suspended solids and bacterial flocs. MBR-C can operate largely unattended with the exception of occasional routine performance checks and maintenance of mechanical components. Segregated bioreactor and membrane tanks will allow for easy operation and maintenance. *Values presented here do not represent guarantees. It solved our wastewater treatment problem efficiently. Thanks! It took us sometime to figure out what system do we need to solve our sewage treatment problem, but Pure Aqua engineers are very helpful and supportive. they made it easy on us. The system is running now for over a month with no issues at all. Thanks! We recommend contacting Pure Aqua if you are still shopping around for the best price...Pure Aqua offers reasonable pricing even with complicated systems like this. Your system solved our water treatment problem here in our city. Thanks! It was hard for us to find a manufacturer that can engineer one like this to run on a solar power. Pure Aqua systems' engineering is very efficient.